VANCOUVER, B.C. - Vancouver Whitecaps FC earned a measure of revenge against Canadian rivals, Toronto FC. A 2-1 Whitecaps FC win officially eliminated Toronto FC from earning a spot in the MLS playoffs. Toronto FC defeated Vancouver 7-4 on total aggregate to win the 2018 Canadian Championship. Vancouver did not forget, and they silenced a crowd of 23,886 fans at BMO Field and sent Toronto quietly into the night. Coach Craig Dalrymple earned his first win with Whitecaps FC since being named interim coach on September 25. The Caps caretaker had this to say post-match. "I thought we deserved it, we built on performance over the last week, corrected some things that we knew we could do better and we executed. I'm really proud of the boys because they believed, came in at halftime 1-nil up and they still weren't happy. They wanted more and wanted to fix a few things that just weren't quite right in the first half and they did to fight for the win." In front of his family and friends, Niagara Falls, Ontario native, Russell Teibert opened the scoring in the 3' minute with his 3rd career MLS goal, and first since 2013. Alphonso Davies found, Yordy Reyna, who sent Teibert through a slow-footed Toronto FC back-line. "Yeah I still haven't even thought about it," Teibert said, when asked about his goal. "I just saw my family in the stands after and that's all I really remember from that. It's super nice to score a goal, let alone score a goal in front of my family and friends in my home town." The 25 year-old slotted the ball past a helpless Alex Bono, to give Vancouver a 1-0 lead. Whitecaps FC haven't scored often enough this season, but when they do score first, Vancouver is 9-0-2 this season. Getting that early goal set the tone for Vancouver. "Today he was playing in front of his family and friends," Dalrymple said, of Teibert. "That's the first time he's scored in a few seasons now so he deserved it. What a great penetrating run, great first touch and we see that a lot in training and it's now come alive during the game so I'm proud of him." Coach Greg Vanney needed his team to respond to a Vancouver side that held an early possession advantage in a 4-1-4-1 formation, and looked dangerous whenever they had the ball. Toronto FC also had their own brilliant opportunities to find an equalizer. After being called on Thursday, to represent Italy during the international window. Sebastian Giovinco was on a mission to help Toronto before he departed for the Azzurri. The Atomic Ant forced Marinovic into making a cross goal diving save in the 13' minute. In the 16' minute, Justin Morrow found a streaking Lucas Janson who got behind Canadian international, Doneil Henry. 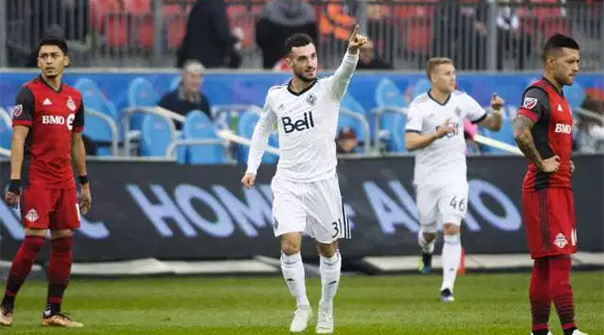 The Argentine striker was stopped point-blank by Marinovic who made a fantastic save to keep Whitecaps FC in the good. The Kiwi shot-stopper was in fine form. Marinovic moved to his left and made a brilliant diving save to deny Michael Bradley his first goal of the season in the 42' minute. Toronto was pressing, but Vancouver was defending well thanks to Marinovic. Toronto FC's attempt to stay in the hunt for the MLS playoffs only grew harder after Gregory van der Wiel picked up his second yellow card of the match in the 66' minute. The Dutch international brought down Yordy Reyna just outside the Toronto box. Referee Jose Carlos Rivero sent van der Wiel packing. Toronto was down more than just a goal. Just as it looked like Vancouver was in the driver's seat. Toronto FC found an equalizer in the 73' minute, thanks to an old friend. Former Toronto FC man, Doneil Henry was called for a handball in the Vancouver box. A penalty was called without hesitation. Second half substitute, Jozy Altidore made no mistake, and easily converted. Undeterred, Whitecaps FC didn't give up and they quickly bounced back, and took the lead in the 78' minute. Reyna started the Caps counter attack, and found Jordon Mutch. The Crystal Palace FC loan, played a perfect ball across goal to an unmarked Kei Kamara. Toronto FC's defence was out to lunch. The Caps leading goal-scorer made sure to smash the ball home for his 14th goal of the season. Ahead 2-1, Vancouver never looked back. In a match where both teams needed three points, it was Vancouver that came out on top. Craig Dalrymple's Whitecaps FC never gave up and kept pushing. In doing so, Vancouver officially knocked the reigning MLS Champions out of the 2018 playoffs. Vancouver now hold an 12-12-7 record with 43 points. Whitecaps FC remain in 8th spot in the western conference just three points back of Real Salt Lake for the 6th playoff spot. If Vancouver is going to make the playoffs, they'll need to continue winning as they have three matches remaining, and little to no margin for losses. Toronto FC fall to 9-16-6 with three meaningless matches to play this season. It's going to be a long offseason for the Reds, as they look to come back and regroup for next season. Known for his tough defensive play in the midfield, Canadian Soccer Jesus isn't who Whitecaps FC look to for offence. Playing the team that first gave him an opportunity in a youth academy. Russell Teibert took his chance, and buried it. Vancouver needs everyone contributing in some manner of form. Russell Teibert's strong defensive work this season was rewarded as he quickly put Vancouver ahead early. "It's a good place to come and take points no matter what time of the season it is," Teibert explained. "We knew the implications of this match and what was at stake. Fortunately for us we got the result here tonight, we got a good performance, probably one of the best we've had all year-long. Especially coming out of the gates, this puts us right back in a playoff contention."